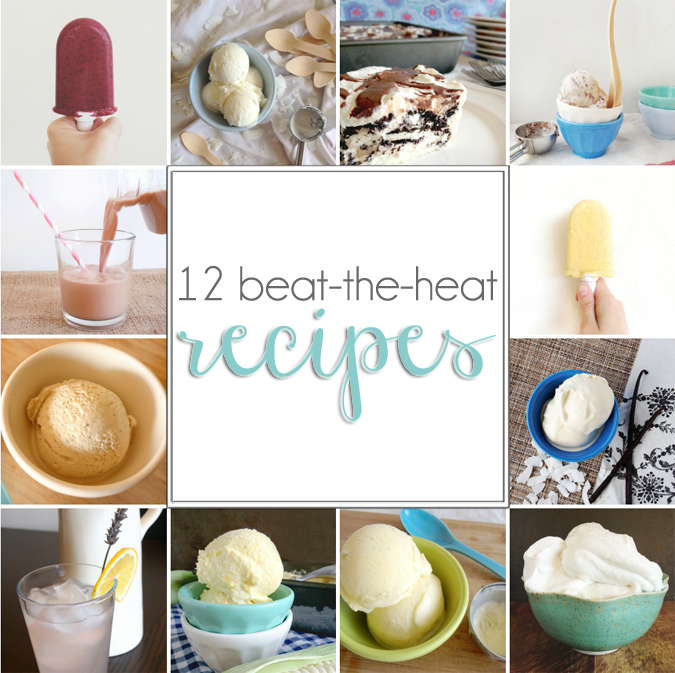 Let's take a look at these 12 oven free ways to beat the heat this summer, shall we? Homemade Blueberry Buttermilk Popsicle // These babies are refined sugar free, use simple ingredients and are packed with vitamins and good for ya stuff. All you need is a popsicle maker! Eggless Coconut Ice Cream // Just like the title says, this stuff is egg free but just as tasty as the custard-based stuff. All you need is some heavy whipping cream, coconut milk, sugar and a dash of vanilla and coconut extract. Oreo Tiramisu // If ever there were a dessert baby made out of the marriage of my husband and I- this would be it. He loves Oreos and I just adore tiramisu. So, it's no surprise this happened. Put it all together and let it sit in the fridge for a bit. Then, serve cold. MmMmm. Nutella Chip Ice Milk // This Nutella chip ice milk is much lighter than ice cream but still creamy and sweet. It's incredibly refreshing on a hot day or night. The Nutella freezes into little chips which harden a bit more than the base, so you're left with slight crunches of chocolate hazelnutty bits mixed throughout. Yum! Vegan Chocolate Milk // This drink almost reminds me of Yoohoo, but with waaaaay better ingredients. Remember that stuff? Spicy + Salted Coconut Milk Mango Popsicles // This is beyond easy! You basically blend coconut milk, mango, sea salt, honey, greek yogurt, lemon juice and a dash of cayenne pepper together, pour into your popsicle mold, and BOOM you're done. Organic Green Tea Ice Cream // Let's boost that oh-so-good ice cream with some green tea antioxidants, shall we? Dessert with benefits? Yes please! Coconut Ice Cream // This is the old school, custard-based ice cream we all know and love. But coconut-a-fied. Because, coconut. Lavender Vanilla Lemonade // Surprisingly refreshing during a heat wave- vanilla, lemon and lavender were born to play together. Vamp up your summer drink staple, stat! Sweet Corn Ice Cream // Summer always means corn on the cob; whether it's at a picnic or grilled during a BBQ. Why not take the beloved summer veggie and turn it into a dessert? Super delicious! Peppermint Vanilla Bean Ice Cream // I know peppermint is usually reserved for the Christmas season, but it shouldn't! Peppermint adds that extra chill and coolness this ice cream needs to really cool you off after a hot one! Whipped Coconut Cream // Whether you're topping a store bought pie or angel food cake, making as a filling for pre baked cookies, or placing a dollop on freshly made milkshakes, this stuff is a delicious and non-dairy way to take you straight to Flavor Town. I've never made ice cream, but these recipes have me adding it to my to-do list. Thanks for sharing! I'm dropping in from the Jack of All Trades link up and I'm excited to dig around the rest of your blog. Oh girl! If you've got an ice cream maker, it's SO easy to make yourself homemade stuff! Plus, the flavor of good old fashioned ice cream is like no other! It's amazing! These all look so amazing! I'm definitely going to have to try soon. Just stopping by from Oak & Oats link up. I love your blog! So glad you found something you like! OHHHHHHHHHHHHHHHHHHH. I need to try all of these! Great sounding recipe!! My question has to do with dessert. Doing a low carb diet, need dessert help. HELP!!!!!! please. Yum! Can't have too many acorn recipes:) I'm trying this tonight.